The Indigo Trust is funding an innovative digital project to support some of the poorest communities in Kenya as they struggle for a basic right that most of us take for granted – the right to live securely in our own home. 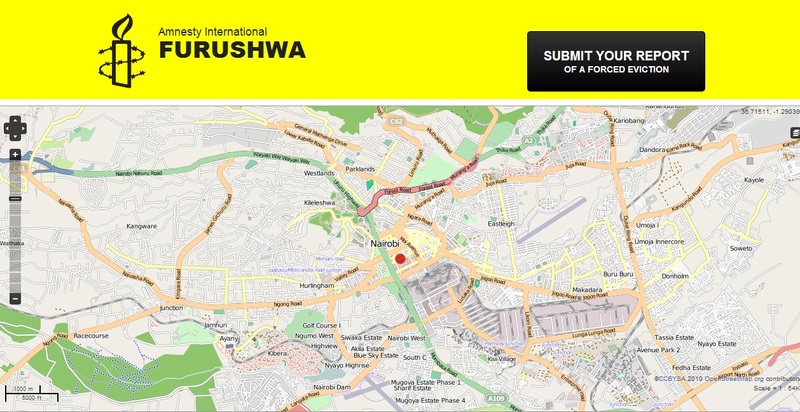 The Furushwa digital mapping website is being developed by Amnesty International with support from Indigo. The site will enable slum residents and housing rights activists to raise the alarm quickly when an illegal eviction is threatened – and mobilise support from around the world to help stop the bulldozers. In the slums of Nairobi, thousands of people are living in fear of being forced from their homes at short notice – often in the name of “development”. In carrying out these evictions, the Kenyan authorities are breaking their own laws, as well as international human rights law. Amnesty International has been documenting Kenya’s forced evictions for the past two years. During this time hundreds have been made homeless by the demolition of their houses and livelihoods. Women in particular are more likely to work at home, and forcing a child from their home will often also have a direct impact on their education. But Amnesty has also seen the difference that international attention can make when an illegal eviction has threatened. In 2010, thousands took action from across the globe to persuade the Kenyan authorities to suspend the eviction of a community of 50,000 from land owned by the state railway company. This new website will be a vital new tool in the campaign for housing rights reform in Kenya, enabling slum residents to publicise and share with a wide audience the housing rights violations that they face. Development of the site hasn’t been all plain sailing. Communication difficulties and differing expectations resulted in project delays, while the distance between Amnesty’s digital team in London and the website developers in Nairobi has, at times, made matters more difficult. It’s been a learning process for all involved, Indigo included. While Skype and email make life a thousand times easier, there’s still no real replacement for face-to-face communication. Still, there’s a great sense of satisfaction and pride now that the site is up and running. Amnesty’s next step will be to train residents from key slum communities to become rapid response activists, equipped with new technology to upload and share information when a forced eviction is threatened or underway. With thanks to Richard Wilson and the team at Amnesty who provided the text for this blog entry.